Price Tag • Run Hard. Rest Well. There is a price tag attached to our overload and exhaustion. A deep discontentment that settles in our bones and sours our soul. Relational tension – combative, distant, destructive. Illness. Mild and annoying. Dramatic and life-changing. Death. How many of us die years before our time? There is a price tag. I write this blog as one who was driven and reckless. I lived under the motto, “I can do all things through Christ who strengthens me.”(Philippians 4:13) True, when living the life God intended. But I chose my way over God’s way. My way was addictive in nature and rooted in a series of faulty beliefs. 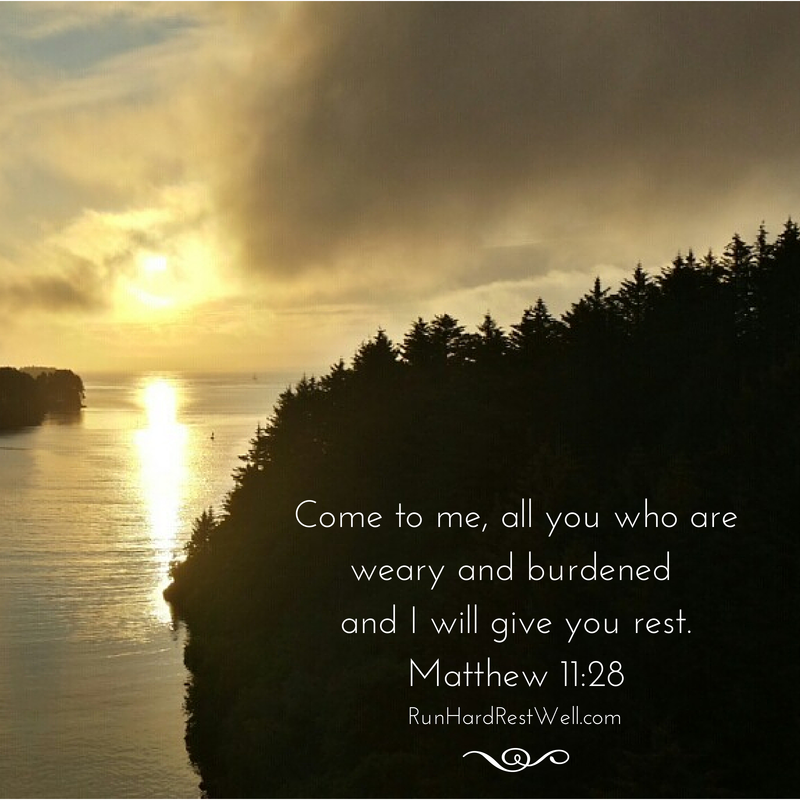 At that stage, I questioned the the truth of Matthew 11:28: “Come to me, all you who are weary and burdened and I will give you rest.” I believed that promise was reserved for Heaven, not a promise for the here and now. I came to God every day, multiple times every day, but there was no rest to be found. There was much to receive—love, forgiveness, joy, marching orders, but never rest. God’s rest eluded me because I came to Him on my terms, not His. I came sweating and heaving, with eyes on the next goal. No time for foot stools, green pastures or quiet waters. God’s pursuit of us is centered on our greatest need and through a series of difficult days and the Body of Christ, God placed me on a journey that would root out the beliefs that were leading to my demise and planted the seeds that would bring life, a life empowered by the rest of God. Sabbath. Stillness. Solitude. Sleep. It’s been a 23 year adventure. I was (am) a slow learner. Sabbath, Stillness (personal prayer focused on the Presence of God), and Solitude (personal retreat) were rhythms God began to weave into my life in a manner that re-sculpted my hardened heart. But sleep. Sleep was for sissies. Sleep robbed me. Sleep was a waste of precious, God-given time. Embracing God’s plan for sleep was my last frontier. I began to take it seriously about 6 years ago. It proved to be an exceptional gift. Pesky ailments that had begun to plague me began to lessen and disappear. I felt like a new woman. But there is a price tag for our overload and exhaustion. On September 12, half of my thyroid will be removed. I’ve been fighting an autoimmune thyroid condition for 12 years, a condition (for me) that is tied to a life-time of elevated cortisol levels, a result of my refusal to get the sleep my body required. Am I beating myself up? No. This is life in a fallen world. There are natural consequences for the choices we make. Some times they are instant. Sometimes they are delayed. Maybe the scar across my neck will speak volumes to another in search of a better way. The promise in Matthew 11 and Jeremiah 31:25 (ESV) is true and sure. “I will satisfy the weary soul and every languishing soul I will replenish.” For this to be ours, rhythms of rest and restoration must be explored, embraced and prioritized as gifts from the Father’s Hand. Where are you at, at this juncture in your life? Exploring? Embracing? Prioritizing? It’s a journey into the heart of God. It comes our way through an on-going exploration of four biblical rhythms that revive, replenish and restore: Sabbath Keeping, Sleep (and other simple stress-reducers), Stillness—personal retreat, and Solitude—personal retreat. It’s an expedition that challenges us at every turn. It convicts us in deep, tender places. It alters our priorities and plans. It’s not for the faint of heart. It’s adventure at its best – as we learn to run the race in a power not our own. Praying for a successful surgery. Rest! Rest! God and I are going toe to toe on this one. A week (more, less) of “mandatory” re-coup time will be a new thing for me. I want to lean hard into it. This surgery sounds like a vacation to me. We are always in crisis. I do “walk the talk” of rhythm. But an extended time…likw what might be before me. I am moving into it with my heart wide open. Jesus lead the way. We are surrounded. Covered. Witnessing God’s hand. Peace reigns. Thank you, Jill. Your prayers are a treasure. Sleep has always been hard for me. Too many demons to fight. Now….sickness rules. Sleep? Still a challenge. So when my body gives out, I’m back to the hospital and dosed with heavy meds that make my body do, what I should have allowed all along. There is a price. Who’s fault? Does it matter? Doctors, hospitals, counselors, get a great deal of money because we don’t take God’s ideal to heart and rest. But I’ve been to the hospital again today so now I sleep. You speak to us with wise, encouraging words. Praying for your journey today and specifically today for a sleep that refuels and restores. Betty my prayers are with you. Sleep, rest. He is the one putting the blanket of warmth on you. I love you, my friend. God knows and understands what I do not. I will trust Him. Church and then a nap. Sleep the great healer, restorer, a vehicle God created in us to repair! We need it, we have to have it, or our bodies will tell us in unfortunate ways! The other vehicles? Good raw foods, exercise, clean water, being still with our Father God! Is this easy? a challenge for sure, think of it as making 1 simple change. What will you change first? Chris – the automatic and “easy” choices we make day by day can lead to our demise or our ability to thrive. Living fully takes intention, a commitment to the best He has, yet overloaded lives leads us to quick, easy and often unhealthy habits. One change at a time, in important. Otherwise we can be paralyzed. So what is it? A bed time. More water. An evening walk. 20 minutes in God’s presence. Less TV. More time outside. One thing. Let’s do one thing this week. Amen, sister! I have struggled with Phil 4:13 all my life. Posters of it are everywhere and scream at me. My kids currently have one in their room. I used to take that verse to mean, “hey Sarah, get off your duff and do MORE because God will strengthen you.” I felt bad drawing limits on myself because it felt like I wasn’t trusting enough to believe God would get me there. Only recently have I adapted a Live Magis motto for my life. It is a “Less is more” mentality. I can do more for God and myself by taking on less. It has changed my life. He is the magis alive prayer I learned from the Jesuits I worked with. https://www.muhs.edu/data/files/gallery/ContentGallery/Magis_Alive_Prayer.pdf. Thank you for this blog! You blessed me deeply this morning as I read your link. Please! Everyone! Read the prayer from this link. God’s Spirit is moving among us. May we listen. May our withered souls revive. May the King be glorified. May we our lives bear witness to the One who lives within. Thyroid, it runs in my family and with friends; they run weak because of the lack of rest. But in our weakness, he cradles us. He walks us through. I understand the agony, because I have watched it. But our agony is only pin pricks compared to the agony and suffering Christ suffered because of us, for us. So Lord bring on the pin pricks; give me reason to keep looking towards you. And while I suffer with pin pricks, others suffer with swords. 9/26 marks the two year anniversary of Pastor Saeed’s imprisonment. He is in Iran; his only crime is being a Christian who legally was opening an orphanage. Meanwhile Saeed’s wife and 2 children are here in the US praying for his return. On 9/26 I will be praying for him, for the persecuted Christians, for Brenda and her family, for Betty, for Shane, for my children, for my friends, and for all of my brothers and sisters in Christ especially for those who have not joined our family yet. And as I type now I realize how the Lord brings us together, Because of my friend, I was introduced to Josh and led to the blog. Because of this blog, my heart prays for many. Because of Saeed’s imprisonment, I have been emailing his wife, Nagmeh. And there is much more “because of’s” that have led me to kind, loving people. His plan truly is Glorious. Pin pricks although hurtful lead to some amazing bandages. Have a blessed week. Beautiful words. In the times when we are forced to stop, we see how blessed we are. We look up. We look around. And we pray. Thank You Lord for calling us to rest and to visit the lives of others. Thank You for showing us these “pin pricks” are mere inconveniences….momentary and light in the face of adversity faced by so many others. Thank You Lord we have You to Whom we cry for the lives of others. Thank You for my blog friends. A special touch today of restoration and healing for Brenda and for Erin, God’s women standing in the gap.